When I first saw the bag in the store I thought to myself..."wait, WHAT?" Firework Oreos? How?....Then, I noticed it said with popping candy, and I was even more intrigued! I knew these would be super fun for the kids to try. The Oreo Wondervault has opened again, and just in time for the summer season. 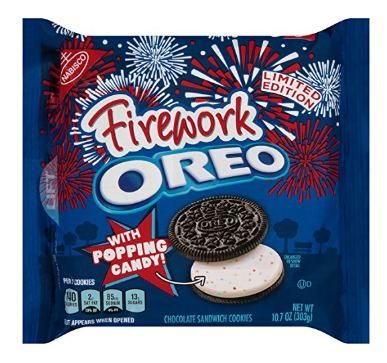 Oreo, milk's favorite cookie, has captured the wonder of Fireworks in a cookie! Supremely dunkable, this Oreo variety sandwiches rich creme with popping candy between the tempting taste of two chocolate cookies. The resealable pack with easy-pull tab keeps cookies fresh and is perfect for snacking, sharing, or traveling. Oreo Fireworks are only available for a limited time. The kids and I really enjoyed this flavor. We definitely felt the popping candy, and it gave the oreos a slightly different taste, which was really good. These are going to be a hit this 4th of July! Be sure to get them while they last!